That’s how an article begins in the Oakland Tribune on May 9, 1937. I would somehow doubt that when you finish reading my columns on the statue, your comment will be, “My, wasn’t that a splendid Homeric tale?” But this is probably the only comprehensive rendition you’ll find of the history of that statue…one which many readers will recall from the days when it stood, from 1958-89, in front of what is now called the Stanley Mosk Courthouse—for most of that time, at First and Hill Streets. Not many, but a few, will recollect when it was mounted augustly on a seven-ton, 12-foot granite base at its original location, the site of a previous courthouse at Broadway and Temple Street. The statue, first dedicated in 1908, has been located since 1989 at the entrance to Cabrillo Beach, near the harbor—representing fulfillment of a spirited decades-long effort by San Pedro to wrest the sculpture from the Los Angeles Civic Center. 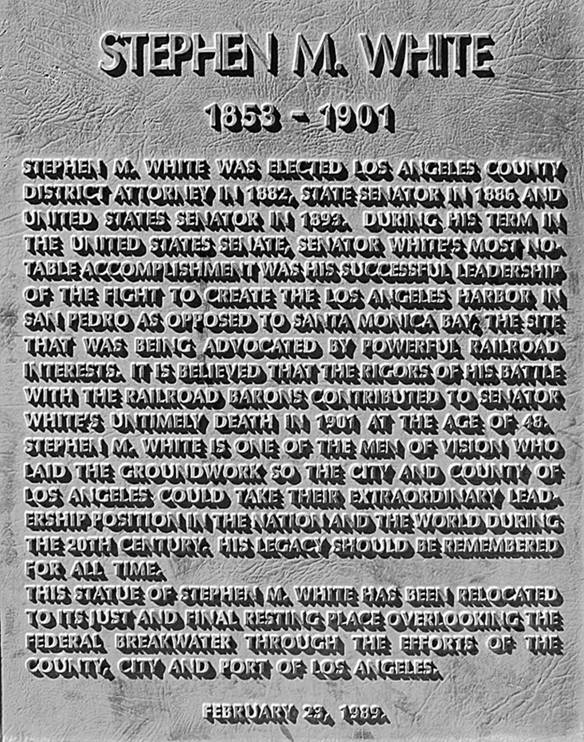 At this point, White’s legacy as the senator who brought the harbor to San Pedro (that harbor now known as the Port of Los Angeles) is perhaps more pertinent than his service from 1883-85 as Los Angeles County district attorney. The plaque accompanying the statue appears below. Harrison Gray Otis was a man who did not lack influence. He was publisher of the Los Angeles Times—a newspaper which had fiercely backed the selection of San Pedro as the site of the harbor. The upshot of Newmark’s suggestion was that the White Memorial Fund Committee was formed which raised $25,000 in private funds to erect a statue. Newmark and Otis were members of its executive committee. So was attorney Joseph Scott, its secretary—who was later to be immortalized, himself, in bronze; a lifesize statue of him, erected in 1967, is to be found at the west end of the Mosk courthouse on the Grand Avenue side, facing the Music Center. Given the support of the staunchly Republican Los Angeles Times and individual GOP loyalists such as Scott (who was to nominate Herbert Hoover for president at the party’s 1932 convention), there was no partisan aspect to the effort to pay homage to the Democrat White. Whether to erect a statue was never much of an issue. Where to put it was. By action of the Board of Supervisors, the question of whether there should be an “erection of statutes or monuments upon the Courthouse grounds of Los Angeles county” was submitted to voters at the Nov. 4, 1902 election. The ballot proposal made no reference to White though it was commonly understood that a statue of him (which by then had been fully financed) was the only one contemplated for the grounds. Voters approved the measure—overwhelmingly within the City of Los Angeles, and by less of a margin in other portions of the county. Deaf-mute artist Douglas Tilden was commissioned in 1905 to sculpt the 8-foot high bronze statue, which would stand on the Broadway side of the county courthouse. “[I]t is particularly fitting that this monument stand close to the courts of this county, in which [White] so often employed his great legal learning in the cause of justice and right, for the protection of the innocent and weak, and for the punishment of those whose deeds were a menace to society, regardless of their station in life, be that high or low. According to the article, Scott turned the statute over to the state, receipt of which was acknowledged by Warren R. Porter, the lieutenant governor (whose post was once held by White). The red sandstone courthouse in front of which the statue stood was severely damaged by the 1933 Long Beach earthquake, and was vacated. Even before it was razed in 1936, efforts were underway to effect the relocation of the statue to San Pedro. “Three years ago we heard the first rumblings. Because of plans to raze the courthouse, on the lawn of which the statue had stood since 1905, the question of disposition came up....Proposal was made to move it to San Pedro because of White’s successful fight to secure recognition of the harbor. There were those who held to their sentimental affections. Ramona Parlor of Native Sons protested the removal. Of citizens who subscribed and paid some $30,000 to erect the statue only three remain today, and they would keep it for Los Angeles. They are Isidore Dockweiler, Hon. Joseph Scott and Hon. Reginaldo F. Del Valle. More attempts at state legislation were to come in this battle for possession of a statue, a battle which was to continue for half a century. I’ll describe later developments in the next column.